No snow around this time of year—just pavement and the various poling machines. But that doesn’t mean you can’t be working on your technique. And with the growing prevalence and importance of double-poling, this seems like a good area to focus on. The herringbone is used when the terrain is too steep to diagonal stride. There are five basic elements to the herringbone. On snow yet? U.S. Ski Team coach Bryan Fish reviews the fundamental body positions and movements for classic skiing technique. U.S. Ski Team coach Bryan Fish shows a double pole drill that uses the broad jump to teach the rhythm and timing of the double pole. Do this drill on rollerskis on soft grass to get the feel without worrying about falling. Have back pain from doublepoling? 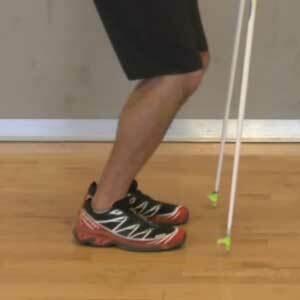 Jason Cork explains he importance of keeping ankles supple for efficient movement and to avoid chronic back pain. U.S. 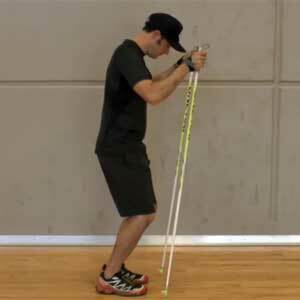 Ski Team coach Jason Cork explains the importance of keeping ankles supple for efficient movement and to avoid chronic back pain when using the double poling technique. U.S. Ski Team coach Bryan Fish reviews the fundamental body positions and movements for classic skiing technique. Think your V2 is good? Try the V4 and see if you can balance with the best! (If you're really brave, do it on roller skis). Downhill skiing is thrilling challenges in high speed that doesn't cost that much energy and gives you a great feeling for the snow, but still a lot of skiers are afraid of the technique and very few are actually focusing on it. During the push-off phase of skate technique, I have a tendency to roll my knee right knee down and toward the centerline, creating an angle that strains the inside of the knee. Would a custom footbed with a reinforced arch help with knee tracking?